bareMinerals and Cosmopolitan officially declared Tuesday, May 9th as National Sleepover Day, a holiday created to celebrate spontaneous sleepovers and the bareMinerals® Original and Matte Foundation Broad Spectrum SPF 15’s newest claim – Makeup So Pure You Can Sleep In It™. The two brands also encouraged women around the country to bare their souls, share their deepest beauty secrets and express themselves through the hashtag #SleepintheBare. To kick off National Sleepover Day and #SleepintheBare, beauty and fashion influencer, Olivia Culpo hosted New York’s biggest sleepover event in Times Square (Pedestrian Plaza between 43rd and 44th street), where attendees enjoyed bareMinerals makeovers, a pillow decorating station, photos on a giant bed bareMinerals and a tote filled with bareMinerals makeup, skincare samples and sleep mask. In conjunction with the event, Sephora Times Square offered complimentary shade matching and makeup touchups, #SleepintheBare sleep masks, and gift with bareMinerals purchase. Sleepovers have always played an important role in both friendships and memory-making often serving as a platform for girls to confide in their friends in a way that can be inspiring, therapeutic, and confidence-building. bareMinerals and Cosmopoltian created National Sleepover Day to celebrate just that — for the spontaneous sleepovers or nights when you skip the sink. The bareMinerals Original and Matte Foundation makes it possible with the claim Makeup So Pure You Can Sleep In It™. The bareMinerals Original and Matte Foundation Broad Spectrum SPF 15 gives all the flawless coverage with a no-makeup look and feel that lasts up to 8 hours. It looks like powder, feels like a cream, and buffs on naturally. This versatile weightless foundation provides adjustable sheer-to-full coverage for a flawless look, yet doesn’t feel like you are wearing any makeup at all. Formulated without preservatives, the five mineral ingredient foundation promotes radiant, healthier-looking skin, to leave you waking up flawless. 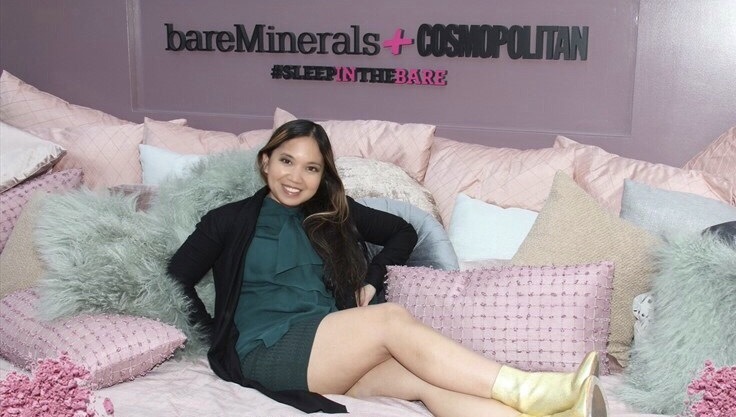 To continue the celebration of National Sleepover Day, bareMinerals and Cosmopolitan gifted sleepover kits to sororities around the country encouraging them to #SleepintheBare. Each kit included all the essentials needed for an epic sleepover including: pillowcases, totes, sleep masks, and bareMinerals makeup. Photo taken by bareMinerals on this amazingly oversized bed! Since I got to the event after all the makeup stations were booked up and finishing up for the day, I stopped into Sephora for a makeup touchup, including shade matching for the Original Foundation Broad Spectrum SPF 15, which felt really natural and lightweight on my face.